After Marines leave, will Helmand progress survive? You are at:Home»Afghanistan»After Marines leave, will Helmand progress survive? Three years ago this month, thousands of Marines were preparing for an all-out assault on Marjah, Afghanistan, a sprawling collection of farm compounds in Helmand province that had strategic importance to the Taliban. The area was a known command-and-control center for the insurgency, and a major supplier of poppy used to finance the Taliban. Dozens of Marines were killed in Marjah the following year, 2010, after U.S. forces rolled into the region heavy on Valentine’s Day weekend. The area has become progressively more peaceful in 2012, although violence does still occur — Lance Cpl. Anthony Denier, of 3rd Battalion, 9th Marines, was killed in Marjah on Dec. 2, according to this news release. A new report by an embedded Associated Press journalist raises questions about Marjah’s longterm future, however. Daoud, the Marjah shop owner, said there was more security under the country’s Taliban regime that was ousted by the U.S.-led invasion in late 2001. “They were never cruel to us and the one difference was security. It was better during the Taliban,” he said. His partner in the rickety shop along Marjah’s chaotic one-street bazaar, Mohammed Haider, said poppy farmers who planted substitute crops such as cotton are losing money because they cannot sell their harvests. He predicted poppy production would double when foreign soldiers leave in 2014. At a bus stop in Helmand’s provincial capital of Lashkar Gah, residents scrambled for dilapidated old buses and cars to go to parts of Helmand. Hamidullah, who like many Afghans uses only one name, was waiting for a bus to Sangin district — the scene of some of the most violent fighting between the Taliban and British and U.S. forces. Like the majority of those at the stop, he wanted foreign forces to leave Afghanistan. I’ve spent enough time in Helmand this year to know that Afghan opinions can vary wildly from village to village. It’s reasonable to assume some of that depends on how strong — and corrupt — Afghan forces are in a given area. Still, it’s reasonable to ask what places like Marjah will look like after 2014. 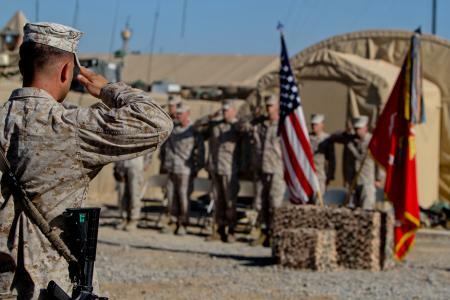 The latest reports suggests as few as 6,000 U.S. forces could be in the country after 2014 as advisers — and most of them will be based in Kabul, far from the conflict areas Marines have walked for years. Nicholson said that while U.S. commanders have made “disingenuous” claims in the past about the extent to which Afghans were acting as equal partners in joint missions, officials now see the Afghan army as ready to operate largely on its own, albeit with key logistical and financial support from NATO. The new strategy as the United States tries to pass on greater responsibility to the Afghan government and military is one of “tough love,” Nicholson said. That’s quite similar to the message I heard in October in Helmand. The Taliban made gains in several regions of the province over the summer, but a Marine spokesman said they were quickly lost after Afghan forces fought back. At this point, that needs to be the case. At some point soon, the Afghans will be forced to stand on their own two feet entirely. It all depends on communication. I have seen unit leaders NOT properly describe the Areas of Operation to one another, and the severe repercussions. Gaining trust from the Afghan towns people and showing them that we are there for them and their families is key. Locals provide intel once they have faith in your units’ abilities. The Afghan soldiers seldom converse with the Marines. Being honest and patient with them as well as consistently talking to them, treating them as they are a part of your unit, goes a long way. Afghan soldiers provide intel as well. When Marines leave, our hard work and unselfishness will pay off, our lack of caring for the Afghan people will surely take away from all our progress though.